While thinking about this blog I received two videos, both of which made me smile, but for completely different reasons. One was of Dilly Keane and Fascinating Aida exhorting everyone to enter into the Christmas spirit, but I’m afraid the language used in the second half of the song precludes my beaming it out. You may well be able to track it down though on the web, under Don’t be a **** this Christmas – perish the thought, although I do tend to be of the humbug persuasion. The second video I received, which I have no qualms about circulating, can be seen by clicking on the YouTube link. As Chairman of the Martin Keighley yard I was almost roped into participating in this, which I’m glad I wasn’t, as it would either have gone viral or been banned. Anyway, all the Keighley team put on their Christmas best, entered into the spirit of it all and are delighted to wish you all a merry Christmas. My wife and I echo the sentiment and hope you have a great run through the festive season into 2019, and may you all have lots of winners. In case you were wondering about the horses’ participation in the sing-song, the animal concerned is the fabulous Champion Court, who is retired at the yard and an excellent schoolmaster for the youngsters, both human and equine. He is famously unflappable and didn’t mind all the endless takes and re-takes of the song. Happy Christmas, Champ. 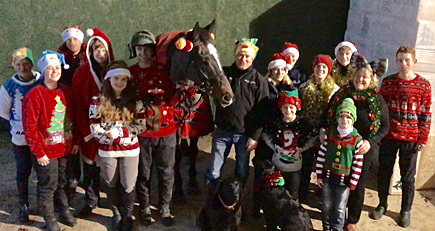 The main reason though for using this Christmassy theme is to encourage everyone to make the biggest contributions possible into the various Christmas boxes and funds for those in racing. Many stables are having their seasonal parties at the moment and all contributions are very warmly received. Some trainers put the money into the pot to help pay for the events, while others give a cash bonus. In Owners for Owners our policy has always been to make a payment for each member in each horse, and we have done that as usual for Karl Burke, Philip Hobbs, Anthony Honeyball, Martin Keighley and Charlie Longsdon. Over the years we’ve got to know many of the staff who have ridden our horses and it never ceases to amaze us how kind, considerate and conscientious stable staff are. Just think about all the early starts and riding out in atrocious weather, often on fractious horses, and it is really humbling. They are the bedrock of British racing. Many thanks to all of them. Finally, and it will come as no surprise, our horse-buying gene has kicked in again, this time with Paul Davis, at Martin Keighley’s. 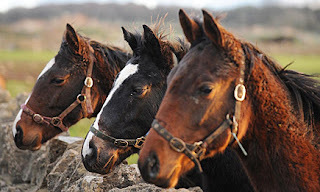 Despite my protestations that I’m taking endless strides towards the poorhouse, the Tattersalls Foal Sale in Ireland persuaded me otherwise and Paul came back with not one, nor two, but three gorgeous foals who are now in the paddocks at Condicote, loving their turnout and their luxury field shelter. This is part of the five-year plan that Paul and I have created to build a really strong base of (hopefully) promising and (certainly) decent value horses for Martin. Paul has decided to go for a stable name theme for each year, and in 2018 it is “herbs”. On the photograph, from left to right, they are called Basil (but definitely not Fawlty), Herbie and Sage. Two are by Sans Frontieres and the other by Califet. Next year the theme may be “Rock Bands of the 1970s”, which is a bit of a give-away on my age. Anyway, tenth shares are available to purchase, and quite a number have already been taken up. If this is of interest to you and your family, please contact me direct. Jack and I have already bought ourselves Christmas presents in all three. Surprise, surprise!